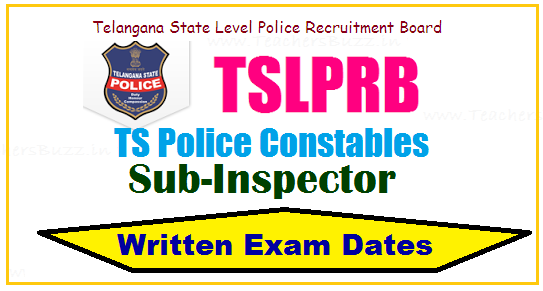 TSLPRB SI, PC, ASI, RSI Posts Written Exam dates 2018 (Preliminary): : Telangana Police Constable, SI Exam Dates 2018: TSLPRB has released Dates of Preliminary Written Test for Constable, SI, ASI and FPB. Already we know that Telangana State Level Police Recruitment Board Announced direct recruitment notification to fill about 18428 posts. The Telangana State Level Police Recruitment Board announced the SI Sub Inspector and PC Police Constable recruitment preliminary examination dates on July 9. SI Posts Recruitment Exam would be conducted on 26-08-2018 by 10 am to 1 pm. IT, Communications SI Exam to be conducted on 02-09-2018 by Morning session and Fingerprint Bureau ASI Exam to be conducted on 02-09-2018 by Afternoon session. Police Constable Posts Recruitment exam would be conducted on 30-09-2018. TSPLRB 2018 Exam Dates have been announced. Telangana Police Recruitment SI Constable examination schedule is now available on tslprb.in. The Telangana state level police recruitment Board announced the sub inspector and constable posts recruitment preliminary examinations. SI Exam will be conducted from 10 am to 1 pm on August 26th. On September 2, mornig IT, Communications SI and Ofternoon Fingerprint Bureau ASI would be conducted. The Preliminary Examination of constables will be held on September 30. The Board has decided to conduct the SI and constable examinations in Hyderabad and 10 important areas of the state. Communications SI and Fingerprint ASI examination will be in Hyderabad and surrounding areas, The Board has decided to conduct the SI and constable examinations in Hyderabad and 10 important areas of the state. Communications SI and Fingerprint ASI examination will be conducted in Hyderabad and surrounding areas. Decisions have been made to make changes in the application. The changes in personal details are to be sent by email to support@tsprb.in till July 14.